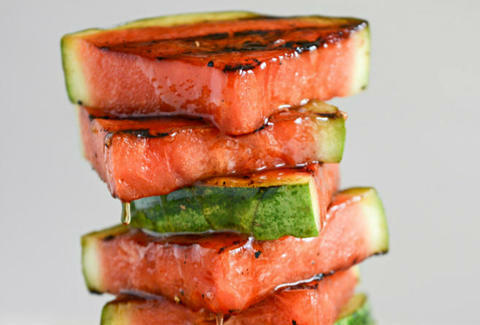 Reaching its peak from May-August, now is the perfect time to experiment with unexpectedly versatile watermelon. So with that in mind, we’ve put together 13 deliciously creative ways to enjoy it. Whether you grill it, freeze it, or simply dice it up, recipes with this hydrating treat are guaranteed to brighten up any summer meal. 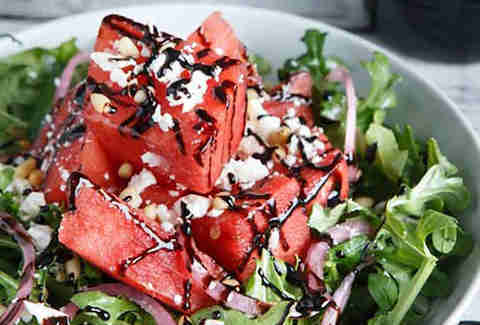 A simple balsamic reduction and drizzle of honey perfectly offset spicy arugula, and the fatty feta adds depth to an otherwise light salad. Recipe here. 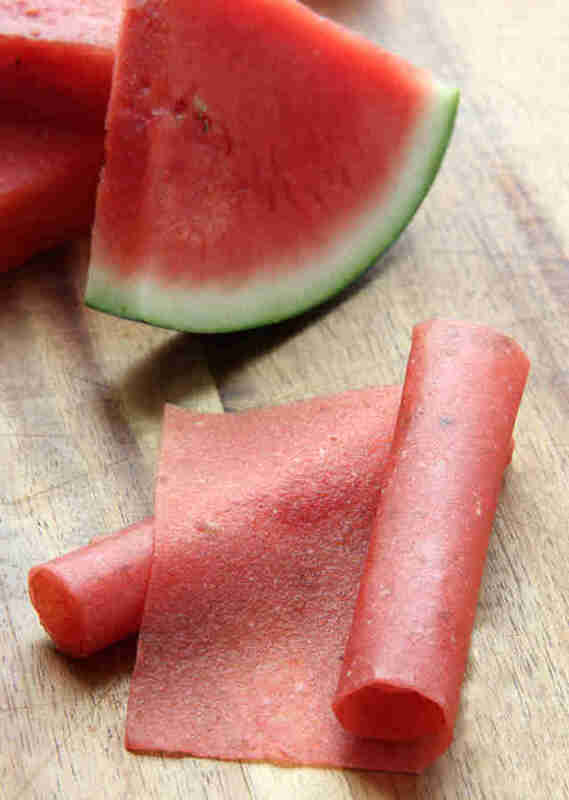 Fruit leather is the homemade version of Fruit Roll-Ups, but without all the dye. Relive your childhood and make this immediately. Roll it here! Two of summer’s best flavors come together in this five-minute dessert (not including freeze time) that anyone can master. Get the recipe. 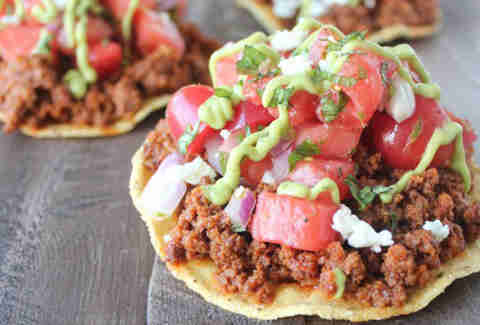 Salty, spicy chorizo topped with a zesty watermelon salsa is offset by a drizzle of creamy avocado sauce for one seriously summery tostada. Recipe here. 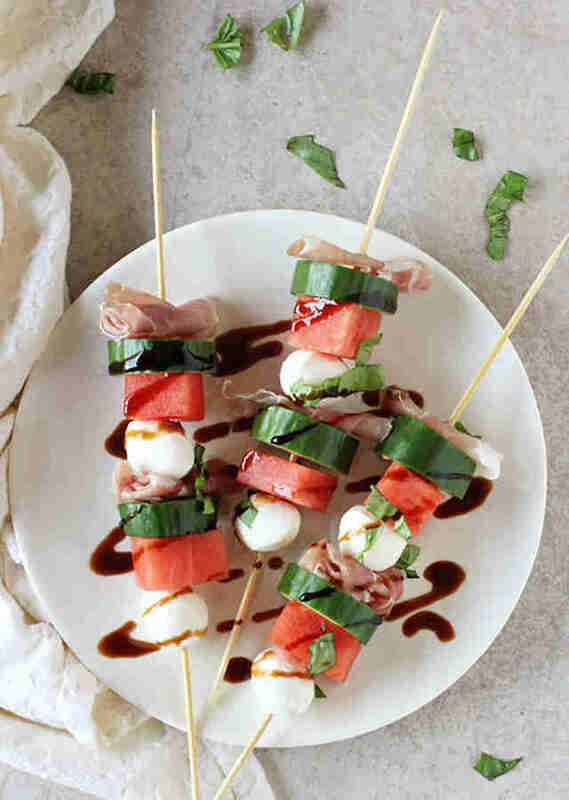 This no-cook recipe threads chunks of watermelon and mozzarella between salty slices of prosciutto and fresh basil for an easy and light summer appetizer that you can make in mere minutes. Find it here! 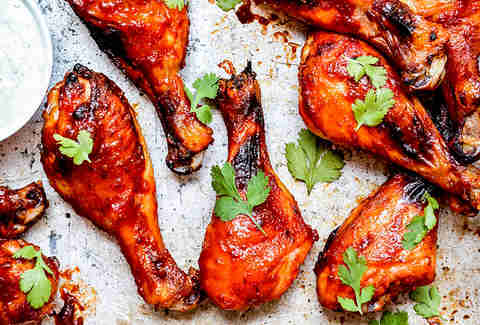 Blend fresh watermelon into barbecue sauce for a truly unique, sweet-and-salty drumstick. Blue cheese cilantro dipping sauce is a no-brainer. Recipe here. Because all great salads have bacon. It’s here! 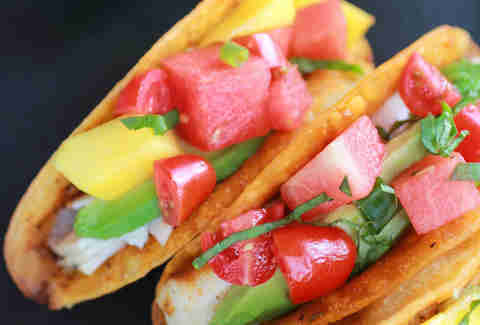 Tacos are great, sure, but the real star of this dish is the boozed-up watermelon salsa. Loaded with mangos, jalapeño, and a nice dose of tequila, it’s got a lot going on, but it all comes together beautifully. Check it out here! 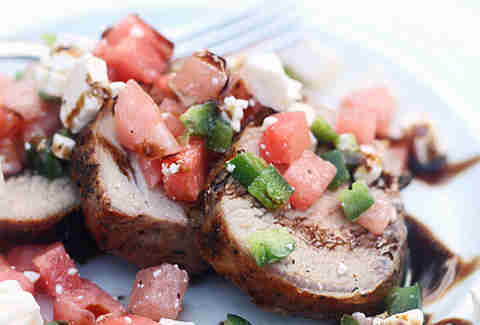 Refresh the standard pork chop and fruit combo by swapping out tired old applesauce for a watermelon and feta pico. Find it here! 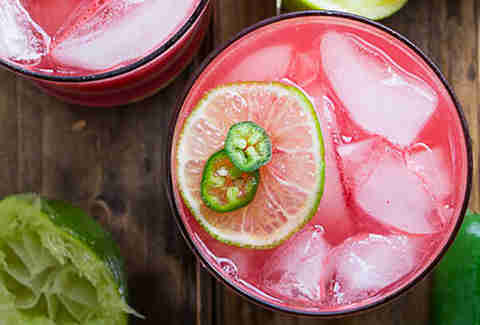 No blender is needed for this sweet-and-spicy summer cocktail. Shake it up here! In this seasonal spin on the classic caprese, watermelon is brushed with olive oil and honey before being grilled to char-marked perfection. Recipe here! 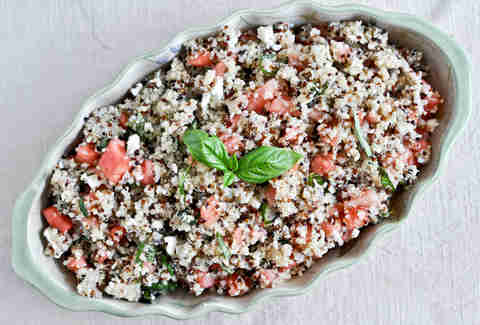 This simple side combines honey-drizzled chunks of watermelon with feta, basil, and quinoa, making it the ideal dish for sweltering summer days. Make it here. 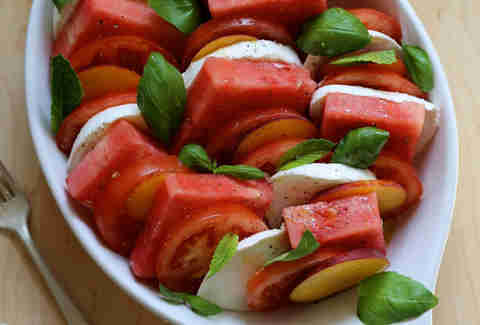 Layer watermelon and peaches between hunks of mozzarella and basil for a no-fuss summer treat that’s bound to please. Ready in just 15 minutes. It’s here!